As you have read in this newsletter, it’s been a year of awards and accomplishments. We’ve had a scare, and at times, the finances have worn thin. More importantly, the work of our mission has continued, with positive companionship, entertainment, inspiration, guidance, education, the Mass and Rosary, news and information. The work can be hard and the hours can be long, but the KNOM staff are dedicated to this mission. As general manager Ric Schmidt accepted our 16th Gabriel “Radio Station of the Year” Award this autumn, he said the list of people to thank would be miles long. You are on that list. You keep our signal beaming strong. We pray that you are surrounded by God’s blessings. Thank you! GETTING SET: (left) In October, volunteer production director Kristina Proctor is moments from the start of an hour-long call-in program on the topic of the No Child Left Behind Act and how it relates to rural Alaska. Discussion was lively and opinions widely varied, but as always on KNOM, the debate was respectful. 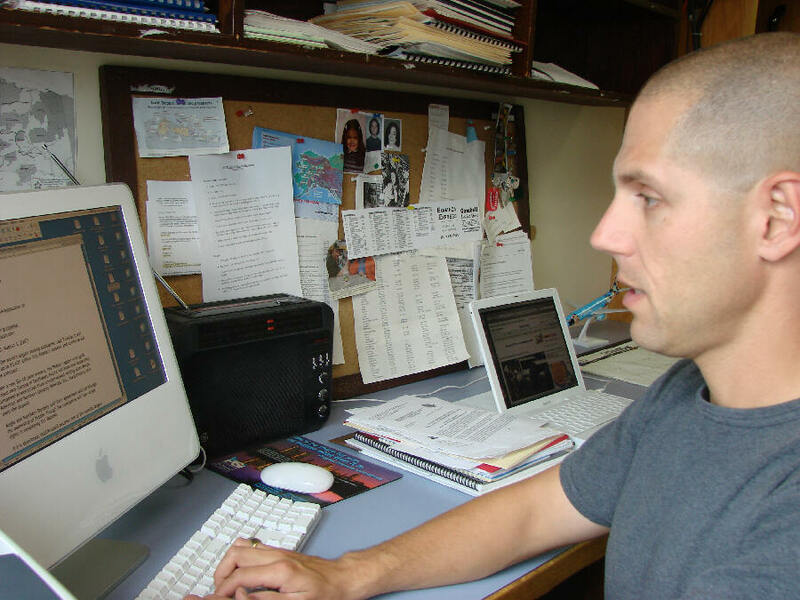 Throughout 2007, KNOM personnel produced about forty similar programs, each one carefully researched and focused on an issue of importance to western Alaska. SPOT COVERAGE: Meanwhile, the mission aired approximately 68,000 spots during the year, half of them educational, half inspirational. Most were written and recorded at the station. 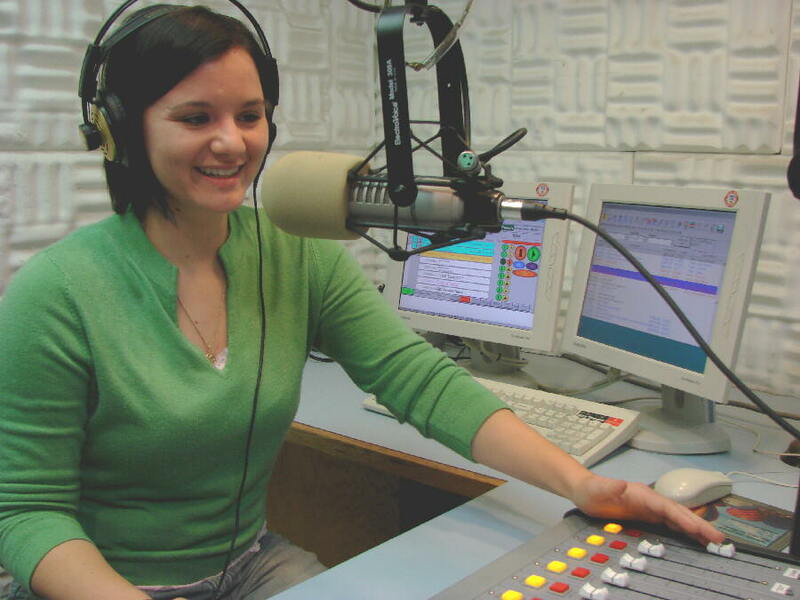 AROUND THE CLOCK: January 9th will mark the 12th anniversary of the KNOM mission broadcasting 24 hours a day. That’s 8,760 hours a year at a cost of $142.63 an hour during 2007. Because of Nome’s extreme remoteness, things here cost 198% what they do in the Lower 48. If we were operating there, the comparable cost for an hour would be only $72.04. We hope you will agree that this is an extraordinary value for a Catholic radio station to which more than 75% of adults listen daily throughout 100,000 square miles. Again, thank you for helping keep this mission alive and active. On the air in 1971, KNOM is the oldest Catholic radio station in the United States, with the purpose of inspiring and informing Alaska Native people throughout this vast isolated region. INSPIRATIONAL SPOT: Your life may be the only gospel some people will ever read. BY THE NUMBERS: It cost $1,249,419 to operate the KNOM mission during the fiscal year which ended June 30th. June 30th, we ended the fiscal year 4% in the black, with income of $1,301,848, a welcome change from the immense combined $485,275 losses of the previous two years. As we’ve noted in previous newsletters, we believe that those losses were the result of events beyond our control, scandals in the Church, as well as Hurricane Katrina, after which huge charitable sums were diverted toward helping those who were made homeless. Into winter, we were still suffering from aftershocks of these events. Thanks to many small efficiencies, we were able to reduce our fundraising costs substantially. It’s something we’ve been working on for years. Despite inflation and the increased cost of postage and material, our fundraising expense was the lowest in the past five years. As in previous years, 97% of our income was gifts from individuals like you. 23.7% Operating: programming, program travel, utilities, etc. Our financial records are open to you. If you’d like a complete set of financial spreadsheets on the mission, or have any questions whatever, we welcome you to write our business manager Lynette Schmidt and she will be happy to provide information in as much detail as you request. WHY ARE WE HERE? The KNOM mission went on the air in 1971 because of road-less western Alaska’s vast distances and the shortage of Catholic priests, nuns, brothers and volunteers. Even then, many villages went for weeks without seeing a priest. Radio was recognized as an effective way of bringing inspiration to these many scattered people. At the same time, the mission strove to improve the many social ills of this area. People here suffered the worst incidences of alcoholism, suicide, accidental death, dental disease, inhalant abuse, domestic violence — you name it — of any region in the United States. They still do, though gradually, their lives are improving. Back then, educational spots focused on simple things, like washing your hands after using the mis-named “honey bucket,” or the need for brushing teeth. Today, they have grown with our audience and are more sophisticated. Many are educational, talking of science or geography. To reach such a high percentage of people over such a large area, the KNOM signal is entertaining, inspiring, affirming and uplifting, addressing the problems which so many see every day. 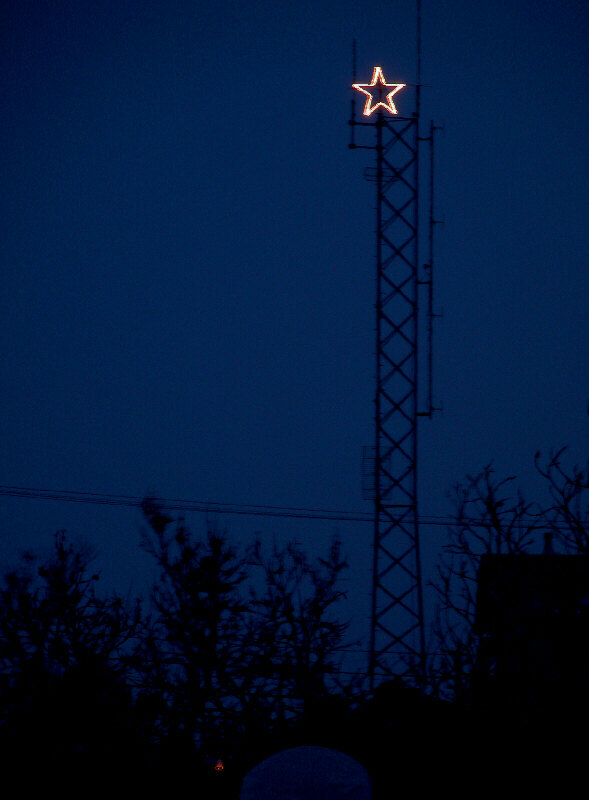 PROCLAIMING: (Left) High above the Nome streets, the KNOM Christmas star has proclaimed our celebration of Jesus' birth since 1971. INSPIRATIONAL SPOT: Hope looks for the good in people instead of harping on the worst. Hope draws its power from a deep trust in God and the basic goodness of human nature. Hope regards problems, large or small, as opportunities. January: The Nome Static reports that during KNOM’s 2006 Christmas call-in program last month, more than 400 listeners sent greetings to over 10,000 friends and relatives. In the second week of the year, a blizzard ravages western Alaska for days. Winds at the KNOM transmitter site exceed 100 MPH, and the station remains on emergency generator power for 67 hours. From 1988-1990, she was a volunteer announcer. Now, Betsy Brennan (left, with son John) is back as part-time office assistant, helping Lynette Schmidt with the station’s mail. 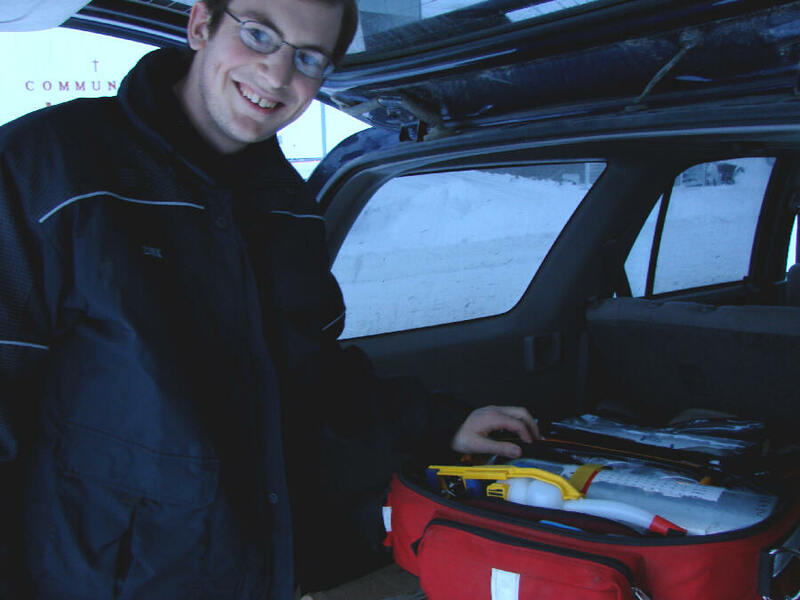 February: Volunteer news reporter Jesse Zink (left) is named Nome’s Emergency Medical Technician of the Year. In the past 12 months, he has responded to 101 emergencies. Jesse keeps a trauma kit in the KNOM 4-Runner, which is often the first vehicle at the scene. Another storm hits, and this time, KNOM is on the generator for 65 hours, broadcasting critical lifesaving information. March: KNOM reports that the Nome high school ski team diverts course after encountering hundreds of reindeer that refuse to relinquish the right-of-way. 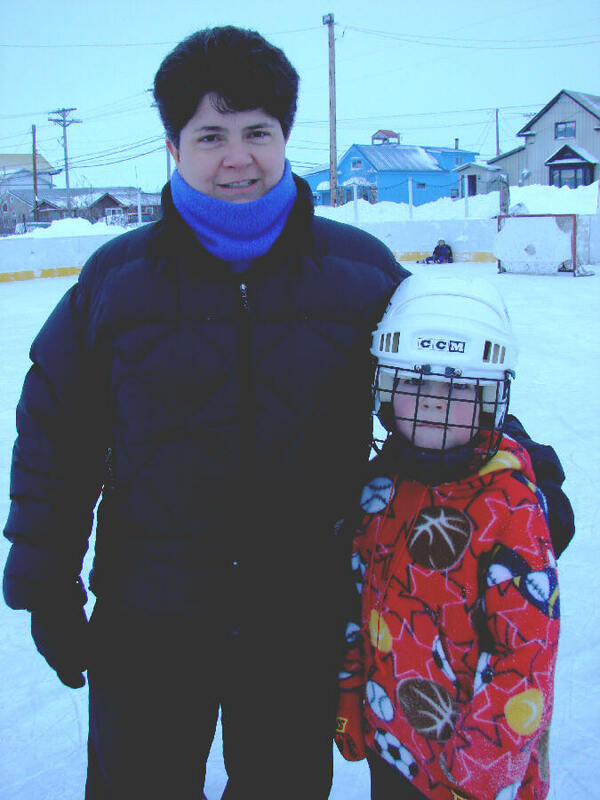 Late March/early April: Public affairs director Amy Flaherty is 284 miles south of Nome, in Bethel, for the Camai (juh-MY) festival. She records dozens of traditional dance performances to add to KNOM’s repertoire of Alaska Native music, which already includes 684 songs. April: Fr. Mark Hoelsken, SJ (upper left), KNOM’s spiritual director since 1998, is in postgraduate studies in the Lower 48. (Left) Fr. Vince Beuzer, SJ, (at left in the image) and Fr. 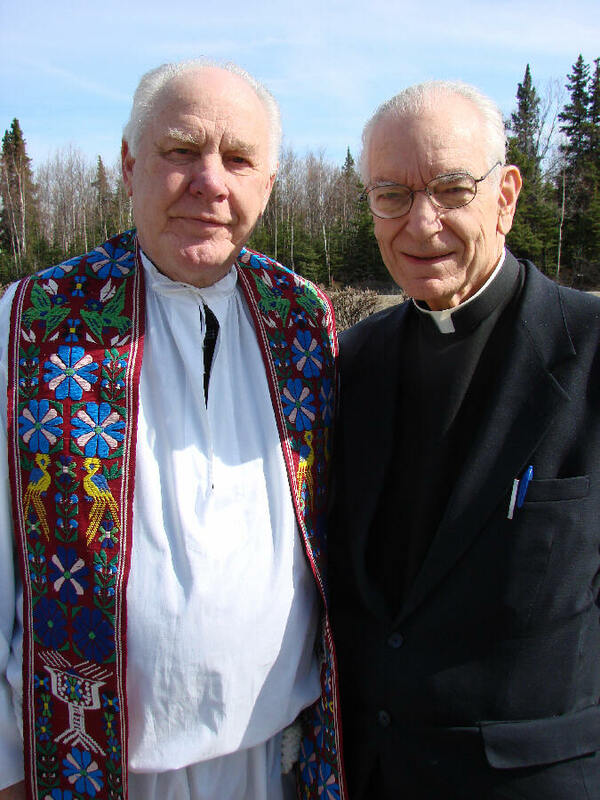 Armand Nigro, SJ, (at right) agree to serve as spiritual advisors to the mission. The two are retreat directors for Holy Spirit Retreat House in Anchorage. May: News director Paul Korchin ( in the newsroom, left) sends volunteer Jesse Zink 1,100 miles to Juneau, to cover the closing days of the Alaska legislature. June 11: A once-every-ten-years thunderstorm hits Nome, thanks to a rare searing temperature of 70�. At the same time, the Bering Sea remains cluttered with ice floes. July: (Left) Former general manager Tom Busch is in Nome and performs annual maintenance on the 25,000-watt transmitter. Among the 800 bolted connections inside, he finds about fifty that were slightly loosened by a year’s worth of vibration from cooling fans, and $140 worth of aging components that need replacement. 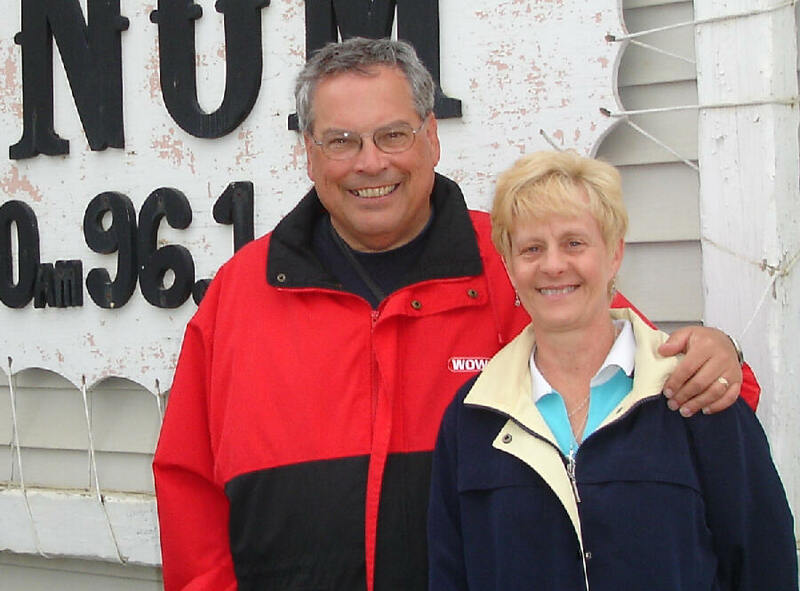 This month, the station is visited by two old friends, Jim and Pat Tighe (left). Jim was volunteer program director for KNOM between 1972 and 1974, while Pat was a volunteer support nurse, contributing her entire salary to the mission. They had been away from Alaska for 27 years and had a great visit. August: Pat Omiak, the mayor of incredibly isolated Little Diomede Island, is worried because the remote village’s telephones are down, he suspects due to a circuit breaker tripping. Before its backup batteries die, he relays instructions over KNOM and the Bering Strait island is soon back in contact with the outside world. September: A man attempts to burn down the station with Molotov cocktails. He is chased away by courageous neighbors and within an hour apprehended by police. Nome’s entire emergency community comes to the KNOM mission’s aid. 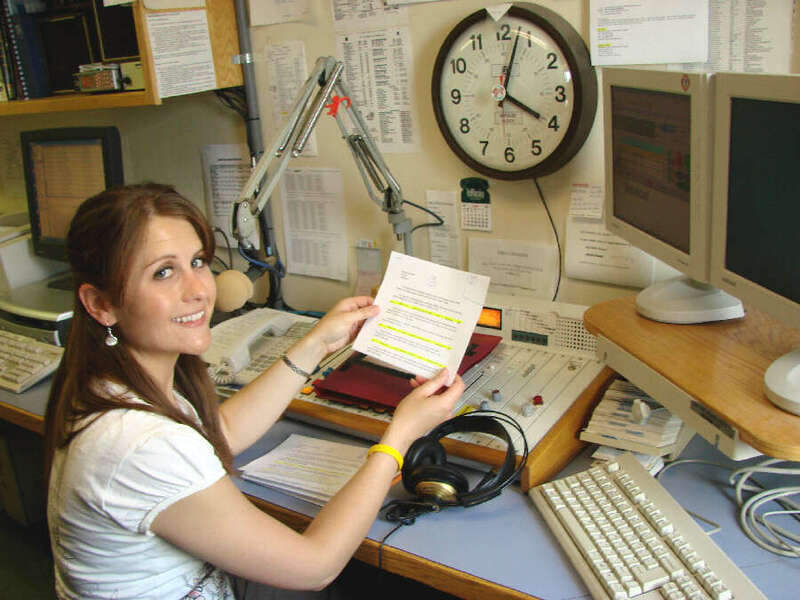 The Nome Static notes that KNOM’s nine fulltime staff, including volunteers, share exactly 100 years of radio experience, 93 of them in Catholic radio. Visiting Nome, former mission engineer Les Brown carefully inspects the KNOM tower, guy wires and tower lights. For program director Kelly Brabec (left), the highlight of 2007 is her wedding October 20th in Fremont, Nebraska. She is now Mrs. Kevin Zweifel. 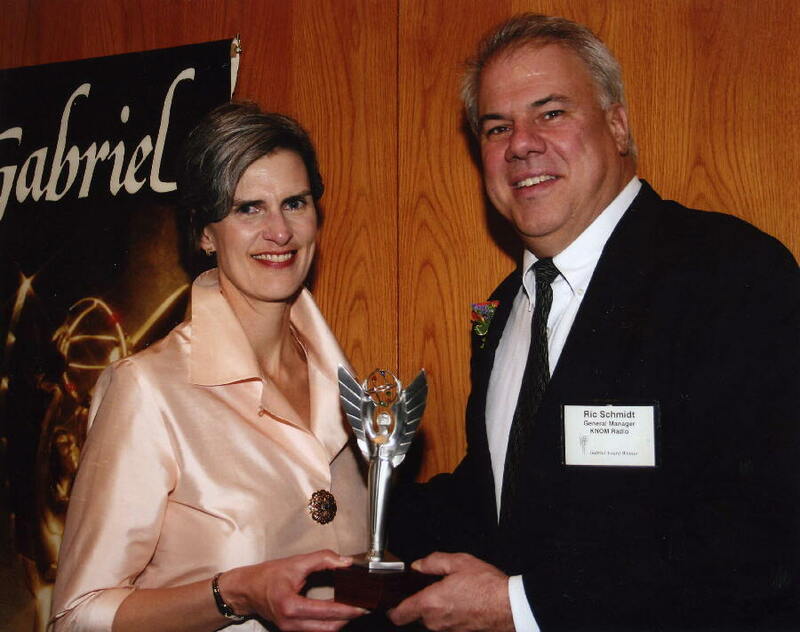 October 26: In Los Angeles, general manager Ric Schmidt (right, with Catholic Academy of Communication Arts Professionals president Jeanean Merkel) accepts KNOM’s 16th Gabriel Radio Station of the Year Award. He acknowledges staff and donors, noting that a list of everyone to thank would be miles long. The same week, Amy Flaherty (left, in the newsroom) flies 526 miles east to Fairbanks to cover the annual Alaska Federation of Natives convention. 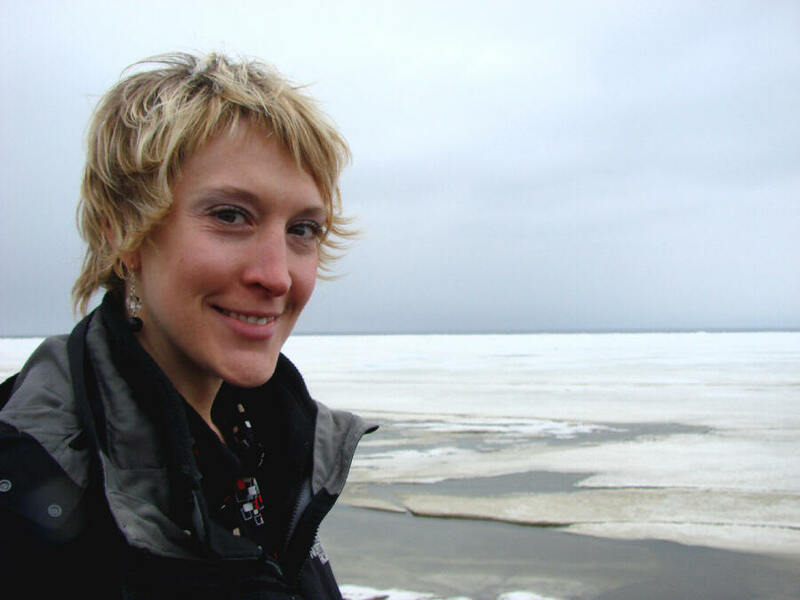 Amy’s other “local news” travels for the station this year include 518 miles north to Barrow, and 511 miles west to Anadyr, Russia. November 2: In Anchorage, Ric Schmidt is handed three Alaska Broadcasters Association awards, honoring KNOM for Best Radio Sports Broadcast, Best Radio Entertainment Program and Best Radio Public Affairs Program. Late November: It’s +4� F. when the furnace in the KNOM studio building quits. The building is super-insulated, and the inside temperature remains at 59�. Though the studios are a bit chilly, staff pray in thanks for donors who made the new energy efficient building possible in 1992 and 1993. The furnace is out for over a week. As always, our year was filled with prayers for you. It is your prayers and financial support that keep this mission station serving thousands of far-flung western Alaskans with the Mass, the Rosary, inspiration, education, positive entertainment and warm companionship, 24 hours a day. Please stay with us, won’t you? We pray that God blesses you and those you love abundantly.